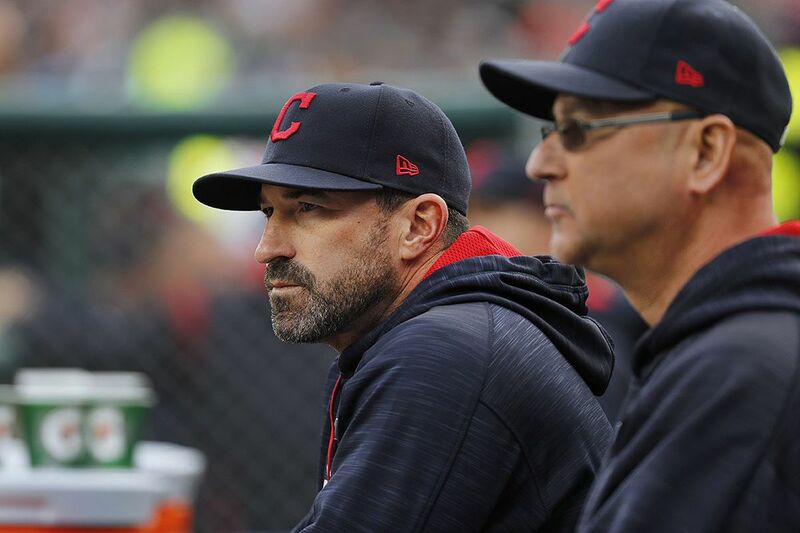 Cleveland Indians pitching coach Mickey Callaway watches with manager Terry Francona against the Detroit Tigers in the first inning of a baseball game in Detroit, Wednesday, May 3, 2017. Mickey Callaway, the Cleveland pitching coach who oversaw one of the better collection of young arms for the last five seasons, will interview next week for the Phillies' managerial job, a source confirmed Thursday. The Phillies have formally requested permission to speak to Callaway, 42. Cleveland.com was first to report that development. The Indians were eliminated Wednesday from the postseason. Callaway has never managed; the Indians pitching coach job was his first in the majors. He assumed that role before the 2013 season. The 2017 Cleveland staff, led by presumptive American League Cy Young Award winner Corey Kluber, was best in the majors in ERA, strikeouts and walks. The staff's 1,614 strikeouts set a new major-league record. Cleveland posted the worst ERA (4.79) in the American League in 2012. From 2013-17, under Callaway's guidance, it was a league-leading 3.65. The Tennessee native pitched in 40 major-league games for three different teams from 1999-2004. Callaway was the head coach for one season, in 2008, at Texas A&M International University. "Mickey has been beyond his years or beyond his experience," Indians manager Terry Francona told MLB.com during last season's World Series. "He's so good. I mean, the game doesn't go too fast for him. You look over at him in the dugout, and he's got a great demeanor. I think if Mickey wants to manage, I think it's just whenever." The Phillies' interest in him is natural. Both team president Andy MacPhail and general manager Matt Klentak have stressed the importance of young pitching in their rebuilding process. A manager with a background in pitching could be a fit, although former pitchers are not as common as managers. One of them, Bud Black, led Colorado to a surprising postseason berth in 2017. Another, Boston's John Farrell, was fired following a second straight division title and quick postseason exit.